Reginald Frank Davey, known as Frank, was born in Yeovil in the summer of 1893, the son of general labourer William Arthur Davey (1860-1932). In 1882 William had married Susan Garrett at Yeovil and they had three children; Nellie (1883-1960), William (b1888) and Beatrice May, known as May (b1891). Susan died in the summer of 1893 and although Frank is usually listed as a son of William's second wife, Frances, I am sure his actual mother was Susan who probably died in childbirth. In any event William married Frances Courtenay in the winter of 1893 at Yeovil when Frank was six months or so old. William and Frances were to have four children; Rose (b1895), Sidney (b1900), Florence (b1903) and Wreford Bert (b1907). In the 1901 census William and Frances, together with William, May, Frank, Rose and Sidney, were living at 71 Sherborne Road. In the 1911 census William and Florence, together with children William, Sidney, Florence and Wreford were living at Smith's Terrace, Newtown. Frank, in the meantime, had begun working at John Cave's grocery in West Coker. In the 1911 census Frank was listed living with the family of John Cave. He was listed as a servant but gave his trade as an 'errand lad'. In early 1913 Frank emigrated to Canada, where he managed a farm in Ontario. In November 1915 he enlisted, becoming a Driver in the Ammunition Train of 1st Division, Canadian Field Artillery. His Service Number was 304113. 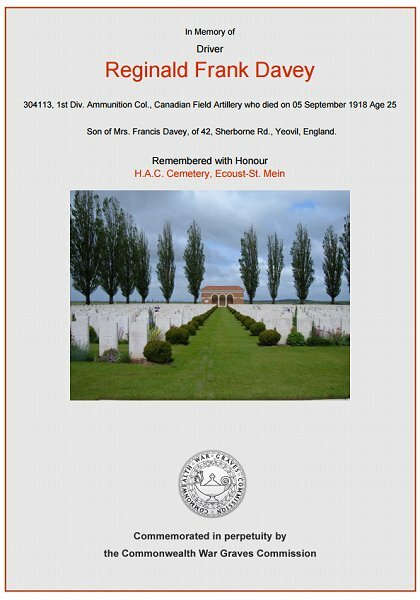 The 1st Canadian Division had been in France since February 1915 but the report of Frank's death from the 20 September 1918 edition of the Western Gazette outlines much of his service "Mr and Mrs Davey, of 42 Sherborne Road, have received a letter from Captain Hugh M Dunlop, of the Canadians, informing them that their second son, Private Reginald Frank Davey (Canadians) was killed in action on the 5th inst. but no official confirmation has yet been received from the War Office. The writer expressed sympathy with the parents in their sad bereavement, and added:- “He was asleep with others after a hard day, in a dug-out, when an enemy shell hit the dug-out, killing him instantly.” The late Private Davey, who was well-known in the district, went to Canada early in 1913, where he was managing a farm in Ontario, but in November 1915, he left his position to fight for his country, and joined the Canadians. He had previously suffered from shell shock, and before being drafted overseas sustained a broken leg and was in hospital in England for seven months. The deceased had taken part in many severe engagements since he went to France over two years ago, and on one occasion was buried by a shell for some time before he could be extricated by his comrades. The deceased was 26 years of age." While his unit was at Chérisy, a small farming village located 9 miles (15 km) southeast of Arras, they came under attack from German artillery. The War Diary of 1st Division, Canadian Field Artillery, for 5 September 1918 (shown below) states "About 9:30pm a shell dropped in the lines of No 3 Section killing 7 other ranks and wounding five. Four animals were killed and 3 wounded." Frank was one of the seven killed. Frank Davey was interred at H.A.C. Cemetery, Ecoust-St. Mein, Pas de Calais, France - Grave VI.F.11, and his name is recorded on the War Memorial in the Borough. The relevant extract of the War Diary of 1st Division, Canadian Field Artillery, for 5 September 1918 noting the death of Frank with six of his comrades. The Commonwealth War Graves Commission certificate in memory of Frank Davey. 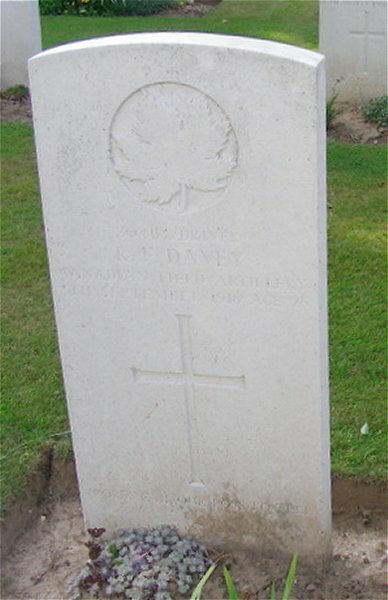 Frank Davey's Commonwealth War Graves Commission headstone.